A few days ago I found myself waking up early morning a little after 6:00 am on December 10th for no apparent reason. 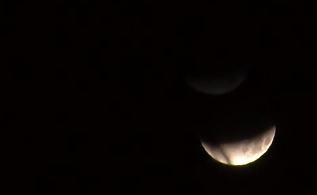 Then I remembered there was to be a lunar eclipse, so like a little kid, I snuck out of bed, put on my coat and rushed out to watch the moon slowly being eaten by the shadow of the Earth. While you get to see 25 minutes compressed into one, I got to reflect on the celestial event and have some sense of why it happens and at what time! It brought me back to my elementary days when I tried to simulate the crescent moon with a flashlight, globe and tennis ball. To think that we were able to come up with Kepler’s laws of motion which could predict the motion of the planets and moons. This seems more magical to me than the old Chinese mythology of a dragon eating the moon. Here was a peaceful reminder that if humankind were to contemplate the heavens and reach for the best of what humankind can offer, then we can achieve much. So while my ancestors might have been beating drums to scare the dragon away, I could have my moment of inspiration knowing that it won’t be long before the moon returns.